Business Analytics is the science of finding insight in data – exploring data to find patterns and interpreting the patterns to gain knowledge and understanding. Everyone in business management today has an interest in analytics to guide strategy, tactics, and execution. This multi-faceted field encompasses a wide range of analytics goals including descriptive, discovery, diagnostic, predictive, and prescriptive analytics. Analysts range from line-of-business managers using self-service visual analysis tools to statisticians and data scientists using advanced statistical analysis techniques. Effective analysts need the skills to find the right datasets, understand data content and structure, blend and transform data, format data for analysis, visualize data and find patterns, and explain the meanings of the patterns. Analytics practitioners work a continuum from data analysis, to causal analysis, data visualization and data storytelling. Finding insight in data is rewarding, but only the beginning. Turning insight into opportunity and innovation is the pinnacle of analytics achievement. 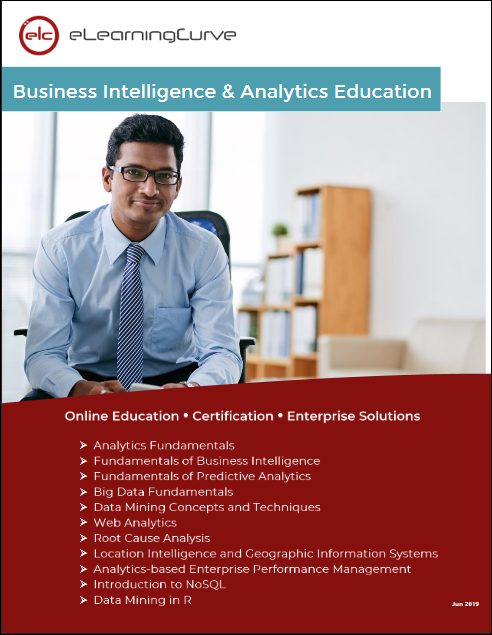 Our Business Analytics curriculum includes eleven online courses. Each course is accompanied by an optional Certified Information Management Professional (CIMP) exam. Click on the course links to explore course details and outlines, learn more about the exams, or watch free Sneak Peeks.